During the Kayak, Bike and Brew Tour! 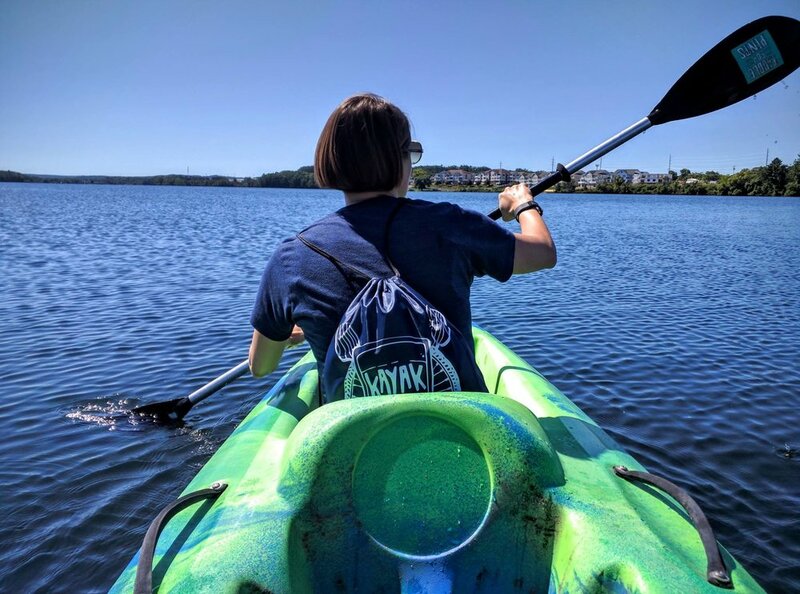 Either Paddle for Pints (if you can get tickets….the entire summer sells out the day they go on sale), or its sister tour, Kayak, Bike and Brew. The tour starts at Pangea’s pizza and allows the group to bike and kayak to 4-5 breweries, including The Filling Station, Rare Bird, Right Brain Brewery and The Workshop Brewing Company. From there, you are able to purchase flights or full beers, along with food. Hopefully, you will end up with a fun group of people like we did! Stop into all the shops along Front Street. If you need outdoor gear, check out both Backcountry North and Boyne Country Sports. Take a day trip to go wine tasting in the Leelanau Peninsula area. I have heard great things about the Traverse City Wine and Beers Tour! Grabbing beers at Rare Bird Pub during our Kayak, Bike and Brew tour! Little Fleet: This isn’t a restaurant, but rather a collection of rotating food trucks, along with a bar. Extremely family-friendly and great for cheap eats. Rare Bird: Not only is this a brewery, but it’s also a full restaurant. A lot of their food is locally sourced…try the burger or grouper tacos. Harvest/Roaming Harvest: This was a really sweet Asian and Mexican food spot (they also have a food truck). We went here for brunch but really should have come back for dinner. The breakfast burrito was spot on and kept me full for most of the day during the kayak, bike and brew tour! Blk/Mrkt: Breakfast and coffee spot in a great area of town right by the Bay. Stop in for some coffee before strolling the beach. Oh, and their Instagram is amazing. Rare Bird: Their brewery was one of the more fun spots on the tour and their beer was pretty delicious. Try the Yas Queen or the Large Marge. Traverse City Whiskey Company: They have tours, along with a cocktail bar. They also sell five different types of whiskey at their store on 14th Street. We ended up stopping here on our way out of town to Sleeping Bear Dunes. The Workshop Brewing Company: This was a hodgepodge of items in a large space near the beach. It’s a pretty cool spot since it has a ton of board games to play and was particularly lovely on a windy, rainy day! Have you been to Traverse City? What are some of your favorite spots to eat, or places to visit? We combined our trip with Sleeping Bear Dunes for a full Upstate Michigan adventure! You can read more about that trip here. We are shipping our Q3 winner his matted and signed 8x11 pic of Avalanche Lake in Glacier National Park this week!